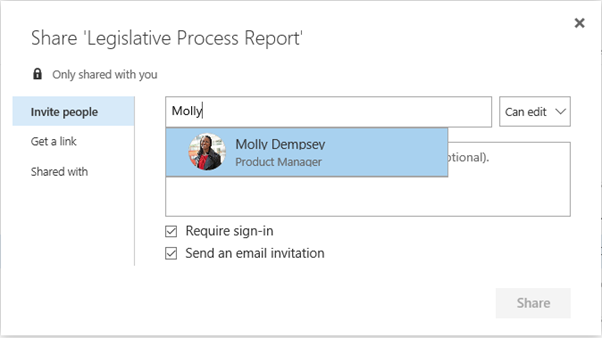 Note: Not using Office 365? 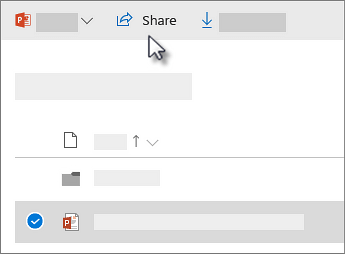 Try Share documents or folders in SharePoint Server or Share documents or folders in Office 365 operated by 21Vianet. The blue text above the names you enter tells you what type of link people will get. For example, Anyone with this link can edit this item. (Optional) Click the blue text to change the type of link. 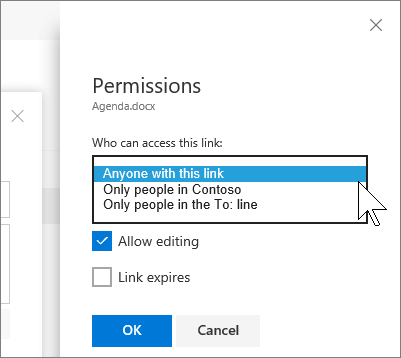 The Details pane opens, where you can change who can access the link and whether people can edit the item you’re sharing. Anyone with this link gives access to anyone who receives this link, whether they receive it directly from you or forwarded from someone else. This may include people outside of your organization. Only people in <Your Organization> gives everyone in your organization access to the link, whether they receive it directly from you or forwarded from someone else. Only people in the To: line gives access only to the people you specify in the "To:" line, although other people not on the “To:” line may already have access. If people forward the sharing invitation, only people who already have access to the item will be able to use the link. By default, Allow editing is turned on. If you want people to only view your files, uncheck the box. (Optional) After you choose the options you want, click OK to close the Details pane and go back to the Share dialog box. When you’re ready, click Share. 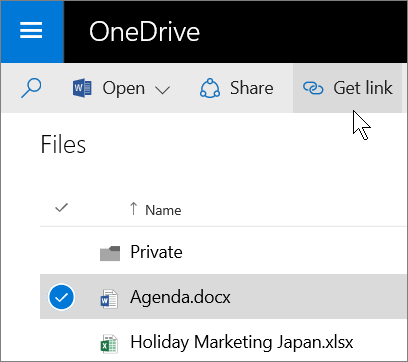 In your OneDrive, click Get link. The blue text tells you what type of link people will get. For example, Anyone with this link can edit this item. Anyone with this link gives access to anyone who receives this link, whether they receive it directly from you or from someone else. This may include people outside of your organization. Only people in <Your Organization> gives everyone in your organization access to the link, whether they receive it directly from you or from someone else. Only specific people gives access only to the people you specify, although other people may already have access. If people forward the link, only people who already have access to the item will be able to use the link. You may be able to share files with external users (people not on your network) by inviting them as “Guests,” or by creating and posting guest links. These links are available by default in Office 365, but administrators can disable external sharing for your sites. For details, see Share sites or documents with people outside your organization. One more way to share is by adding people to the file or folder. 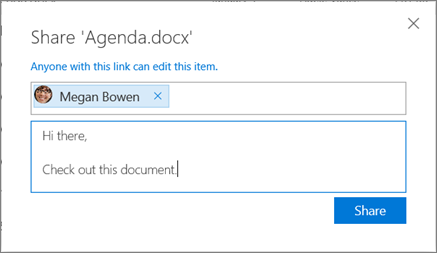 In your OneDrive, select the file or folder you want to add people to, and then click the Information icon. Scroll down to the Sharing section, expand it, and then click Add people. In the Share dialog box, enter the names of people you want to add, choose whether people Can edit or Can view, and type a message if you want.